Oh, baby, do we have a fun giveaway for Baby Week! It’s a Graco Sweet Snuggle LX in Oasis for one lucky GeekMom reader. These amazing swings really help you get in the swing of things with your new little one, providing them the back and forth comfort they’ve come to love (and you a moment’s rest). It’s sleek and stylish, a model of modern design, and its compact shape and small footprint mean it fits great in almost any house, large or small. You can read more about the Graco Sweet Snuggle LX over on Amazon.com or your friendly baby product retailer. 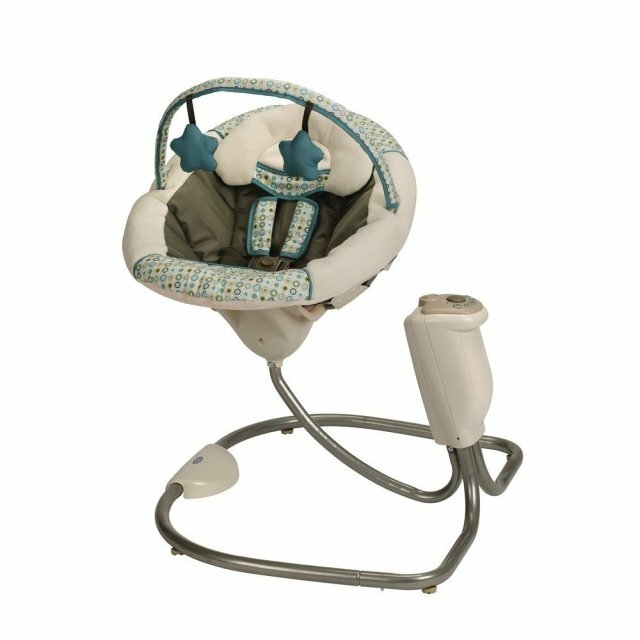 Removable head support keeps your baby cozy as an infant, and allows the swing to grow along with your little one. One-hand, 2-position reclining seat makes it easy for you to help your baby get cozy. For chances to win, click the link below! We’ll pick a random winner from the entries next week. Happy swaying! The best purchase I made was a Kelty backpack which held the kiddo. We went everywhere with that backpack. We even hiked to the top of Diamond Head with her. When we first brought home our little one we made sure to keep her close. Our bedroom is large enough that we were able to keep her in a pack and play with a clip / velcro piece that keeps her about 1 foot below the rim. Don’t know how we would have made it through without it. We are expecting our first and second (yay twins!) this summer, and we are just overwhelmed with the baby bouncer/swing decision! The only consistent advice we’ve received is that we need one or the other. Everyone says they were life savers for their kids. There are just so many decisions I haven’t narrowed down which one we should get. I love our Ergo. We have a hand-me-down stroller that we’ve never touched, but we use our carriers whenever we go out. This may sound dumb or simple, but our lives changed when we learned how to swaddle with a good swaddling blanket. We eventually got one of the Swaddleme wraps, but a nice blanket worked just as well. I totally agree with the swaddling! Our son was born in 2006, and it took two months until my neighbor suggested the Miracle Blanket — I thought it sounded too good to be true. But it wasn’t! Best $30 ever spent. My baby is only four days old, so my experience is limited, but so far it’s all about the swaddling blankets (which we’re liking better than the velcro swaddlers), and the boppy. But you all probably knew that already! Swaddleing for certain but also the Happiest Baby on the Block DVD. It gives a great tutorial on swaddling and the other suggestions work great like side lying and swaying. Hi! Just wanted to see if this has been shipped out because I still haven’t received it. My son is 2 weeks old now, and we’d love to use it with him! Thanks again for the awesome prize!